When I was planning my wedding it was stress stress stress!! I wasn’t expecting it to be as stressful as it was, because I had grown up working at a bridal fair, and I had already done many wedding videos. Because I had seen so many options, I thought I knew exactly what I wanted. Unfortunately it was the opposite. Because I had seen so many options, I didn’t know what MY taste was. I knew that photography and videography (of course) were my two top priorities, but I had seen so many different styles and weddings that I was easily persuaded by other’s suggestions. Then I would feel stressed because deep down I knew it wasn’t really what I wanted. After going through the planning process myself, and working in the wedding industry alongside amazing photographers, I have learned how important it is to choose the right photographer. I know you’re thinking “why isn’t she telling us about videographers since she is one?” Don’t worry I’ll get to that, but in my opinion, the photographer is the most important person because it is vital that they fit your personality and needs/wants (closely followed by the videographer) because they essentially run the show. (or don’t if you don’t want them to!! 😉 Because they have to make you pause and pose the entire day, they are usually giving orders. If you don’t like the way they do things, you won’t enjoy your wedding day! If you connect with them, like their style, and feel comfortable with how much you’re paying them, you won’t mind when they ask you to do this or that, and you will have a wonderful wedding day that is captured just the way you want it to be!! 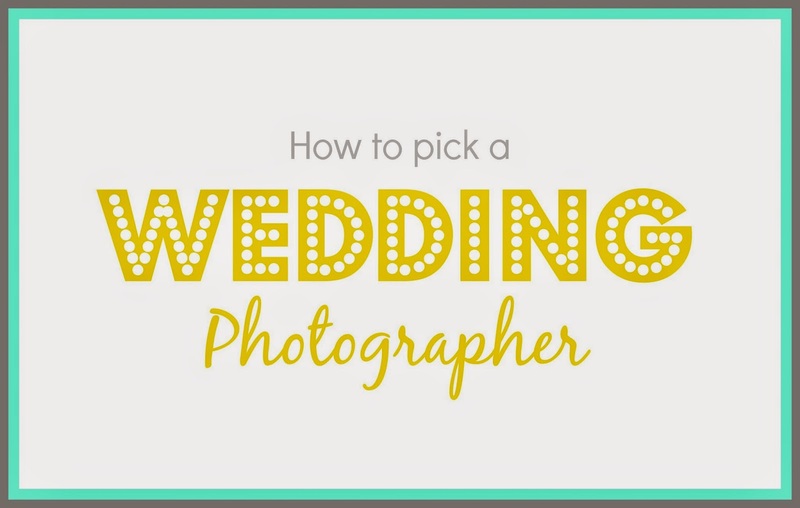 So, how do you choose the right photographer? 1. First decide what you want out of your wedding photos. I bet you are surprised to see this first, but believe me it is most important! It basically comes down to whether or not you want the rights to your photos. If your photographer doesn’t give you the rights to their photos then they usually offer some sort of package where they will print a certain amount of photos or they will create a photo book for you. If you want them to take care of everything, then there’s your choice! But if you want a little more freedom with your photos than your other option is to get the rights and they will give you a disc of all your images. Personally I think the second option is the best because this allows you to post your photos anywhere you want. I am a huge Shutterfly fan and use it often to customize my own photobooks, so even if you don’t think of yourself as a designer or tech savvy, you can use Shutterfly to do anything your photographer would do. Trust me! It’s very user friendly and you can create all sorts of prints from large canvas prints to small 4×6 pictures. Whichever option you choose though, be sure to double check with your photographer that there are no hidden fees associated with either option. 2. Determine your style and stick with it. If your mom or mother-in-law is paying for the photographer, they may try to push you to do their style. Don’t give in! This isn’t selfish. Any decent wedding photographer can mimic other styles and will gladly appease your mother’s need if you let him or her know that your mother would like some _____ type of shots as well as their own style. This is a much better option than choosing someone who doesn’t shoot in your style and asking them to mimic someone else’s style for YOU. Or worst case scenario, you don’t even say anything and you end up with a bunch of wedding pictures you don’t even like. Here are a few basic descriptions of styles, but your best bet to find your style is to do lots and lots of research! documentary: Instead of a series of posed photos, these are candid or spontaneous pictures of people, decor and the action. classic portraits: These are posed shots of the two of you, friends and family in front of various backdrops. fine art: Though it’s similar to documentary photography, this style gives the shooter greater artistic license to infuse their particular point of view and style into your photographs. So while the shots reflect reality, it’s the photographer’s reality. If you know your budget, you will be able to make a much more informed decision on your photographer. Also, don’t be afraid to ask a pricey photographer you’ve fallen in love with if they’ll work with you on price. You never know so it’s worth a try. Sometimes they can do things like only come to part of the reception, or only edit a certain number of images, etc. Everyone likes to be flattered so if you really love them, tell them!! 4. Go to the consultation!! This is your number one chance to see if your personalities mesh, and for your photographer to get to know you as well. Not only do you want to feel comfortable with your photographer, but you’ll want them to feel comfortable with you as well. The consultation is also where you can ask all of your important questions and explain to them exactly what you want. Make plans to speak with a few different photographers. You might not know what you really want, until you chat with different professionals. 5. Ask your fiance what he wants. Make sure you keep your fiance in the loop. It’s his wedding too!! 1. Choose me!! For all those memories that just can’t be captured in a single moment, that’s when video becomes so important to your special day. Video captures intimate music, special toasts, and roaring laughter, in a way that photography can’t. Choosing a perfect photographer is a most essential part of event planning. If we haven’t selected professional photographer then it may ruin your memories. I always recommend hiring photographer by the references of your closed ones.